We have the experience needed to get the job done right. Our team has built dozens of pools all over Souther California. We can provide references and detailed project photos of work we have done. How can you get a quick estimate... It’s really simple. It’s Free, and you’ll save some time. • First, You fill out a short form; You’ll tell us what sort of pool or spa you are looking to build and tell us how we can reach you. • Second, We Come to You. Next, you meet with one of our representatives at your home to discuss your dream pool. All our estimates are Free. • Lastly, Get a Great Deal! If you like the estimate (and you will), go for it! 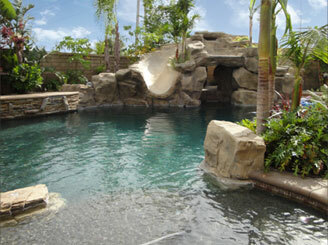 You will be on your way to working with one of the top rated pool companies in So Cal. Your dream pool is just a few weeks away. SEE OUR RATINGS provided by "SERVICE MAGIC"